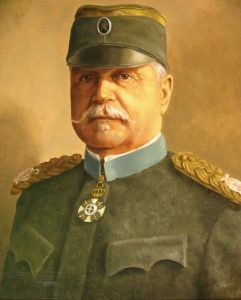 Union of the organizations of reserve officers of Serbia (UORO of Serbia) is founded in 1919. on the initiative of general Stepa Stepanovic, who was the honorary president of our organization. The Day of organization is September 15th which is the day when Serbian army breached the Thessaloniki Front. Union of organizations for reserve officers of Serbia (UORO of Serbia) is non-governmental, non-profit, non-political, professional association of organizations and associations, in which, in order to create and promote sustainable, functional and effective association of reserve military officers to achieve common and general goals and tasks in the field of defense, security, protection and rescue of people and material goods, voluntary and equally join organizations for reserve officers in the Republic of Serbia (hereinafter: the organization of ROS). In the Alliance may associate organizations and associations of ROS, as well as other organizations, associations and their unions, whose activities and actions are of the interest for the achievement of the objectives and tasks of the Union. Union cherishes tradition and promote best practices and experiences of organization, association and work of reserve officers and non-commissioned officers, who were active in the Association of reserve officers and warriors, founded on September 15th, 1919. Union achieves its goals in the areas of defense, security, protection and rescue of people and material goods. The objectives of the Union are: monitoring, analysis and study of the place, role and the duties of officers and non-commissioned officers in the reserve and their abilities to perform their duties in a modern structure of security and defense system, the organization of the army and its missions and affirmation and popularization of the role of officers and non-commissioned officers in reserve to perform those duties; development of professional skills, aptitude and creativity through training and education of members; cultivation and preservation of the moral and ethical values, honor and reputation of the carriers of ranks and duties of officers and non-commissioned officers in reserve; informing members about current issues related to security, defense, military, protection and rescue of people and material goods, external and internal challenges, risks and threats; consideration of draft legislation and subordinate projects in the areas of security, defense, protection and rescue of people and property and participation in public debates on these projects, in order to obtain higher quality solutions; active participation in the development and improvement of civil-military relations in society; support and involvement in the activities of state bodies on the promotion and popularization of the military profession and the promotion of occupational officers, non-commissioned officers, contract soldiers and members of the active reserve status among young generations; launching initiatives to regulate certain issues of importance for officers and non-commissioned officers in reserve and their organization through appropriate legal and sub-legal solutions; perceiving of the the status issues of its members – officers and non-commissioned officers in reserve and to provide legal and other assistance in solving their problems, based on the principles of mutual solidarity, mutual trust and helping members; participation in building and developing mechanisms and instruments for democratic civil control and public oversight of the security sector and armed forces; performing the delegated tasks and duties of general interest, on the basis of an appropriate act of a competent state authority or local government; to cultivate the libertarian tradition of the Serbian people and memories of significant events from the history of its struggle for freedom and independence against aggression, occupation and oppression and influencing the development of the moral values of its members on this basis; cooperation with state authorities and government institutions and local and international non-governmental organizations, whose competence and scope of activities is directly related to or close to the prime objectives set out above and the interests of the Organization.